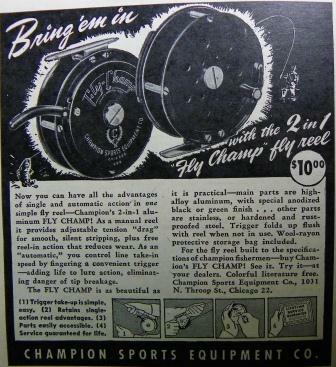 And for two-thirds of the price of the rod, slap one of these Champion reels on that baby and you’re almost ready to hit the water! This is the first installment of “Flashback Friday” a new feature of The View From Fish in a Barrel Pond, scheduled to appear, generally, on —Fridays. put me down for 1 of each. If I am looking forward to a flashback, how would one conjugate the verb? QG, that would be about $150 for the rod and $100 for the reel today. Still a great deal. You wouldn’t find new bamboo at LLB or anywhere else for that price! Pretty pricey, actually. I bought my first fly rod right after WW II (first shipment the sporting goods store rec’d after peace declared). That would have been 1945 and I paid $8 for it, a 9.5′ split-bamboo rod. I forget the line size (size G, probably), but a size #8 by current rod sizing. I still have it and try to catch at least one fish a year on it. An old pal, really.